As a voice actor who likes to travel and still earn money at the same time, I’ve been searching for the ‘right’ gear to take on the road for quite some time. Over the years I’ve gleaned ideas from peers and mentors, the later being the late Paul Hardy – who often kept his business running while on holidays, all around the world. When I first asked Paul how he dealt with hotel room noise – I laughed at his answer, but these days I do a similar thing! (thanks Paul!) Paul would create a make-shift booth by hanging the doona/blanket around the edges of the ceiling fan. So what do I do and what equipment do I use ? 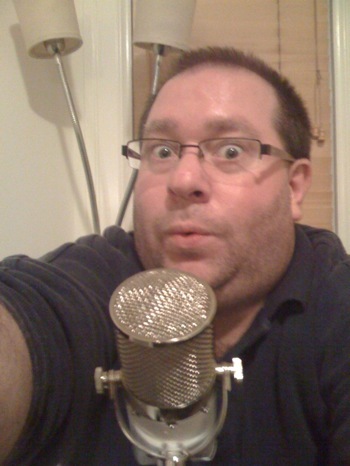 Firstly, I use a very nice USB mic (SE2200USB), plugged into my laptop, using the very easy to use AUDACITY software. For a non-roomy sound, I throw the doona/blanket over my head or climb under the covers. The SE mic has a nice large diaphram and sounds pretty good for a USB mic. (I have already tried and owned several USB mics, but this one sounds best so far). The SE has another great feature. Not only is it a USB mic, it also has XLR connector – so this is my studio mic in the home studio too – plugged into the ProTools Mbox suite. Recently when in the US for MacWorld Conference, the mic paid for itself with around 15 voiceovers done that week, in my little hotel room on a very noisy street in San Francisco. I think the mic sounds pretty good for what it is – the demo file here is unprocessed – take a listen for yourself and feel free to leave your comments. I kinda like the irony of an Australia Day commercial recorded for Brisbane radio while in a hotel in San Francisco. mate it’s all smoke and mirrors – don’t give away too much of thre secret as yo how we all do it ! thr majic will look too plain and boring then ! Is it just me, or does anyone else want to correct Abe’s typos? They might not be super convenient for plane travel – but check the links out might be worth thinking about. awesome Justin, thanks for that ! I had actually checked out the SE version while I was in the states, but had not seen the other one. Thanks for the ideas ! I miss Paul a lot: he was always full of great advice and tricks like this, and a fantastic guy. me too Tommie… miss Paul heaps. he found a special place with a lot of us.